For at least a decade now, Fife farmers have been finding a way to market that has avoided the high-volume supermarket route and reduced the food miles between field and fork. Typical of this movement are small-scale, family farmers such as Jim and Jennifer Wilson of Balhelvie Farm in North Fife. Like many of Fife’s small producers, Balhelvie’s cattle and sheep graze in the fields for most of their lives. Grass elsewhere on the farm is made into silage and hay to cope with the winter months, as is barley and fodder beet. The animals are allowed to develop naturally, and not pushed to fatten quickly. When the time comes for slaughter, the small-scale nature of the process means far less stress for the animals. Rather than sharing a large truck on a journey to a live auction market or far-away abattoir, one or two beasts go quietly in the back of a trailer, often accompanied by the person who has cared for them from birth, to a small local slaughterhouse. Thus, stress is minimised and meat quality preserved. The next stage in the process is equally important. Balhelvie beef is then matured on the bone for at least three weeks. As the meat shrinks and dries, the flavour develops and deepens, while enzymes break down muscle fibres to produce a tender piece of meat with the classic look of dark-hued, fat-marbled Aberdeen Angus. If your penchant is for pork, the name to know in Fife is Puddledub. Behind the range of fresh cuts, dry-cured bacon, hams, burgers and sausages from Clentrie Farm by Auchtertool, not far from Kirkcaldy, is Tom Mitchell. He is one of the founding fathers of the farmers’ market movement in Fife and remembers the sunny September day in 2000 when he began to sell his Duroc/White cross pig products direct to the public. ‘Selling my pigs into the commodity market down in Yorkshire was not economical for a small farm like ours. The farmers’ market meant I could go direct and tell people our story.’ Today, Puddledub is going from strength to strength, with new kitchens on the farm primed to produce a full range of cooked pork products and charcuterie. 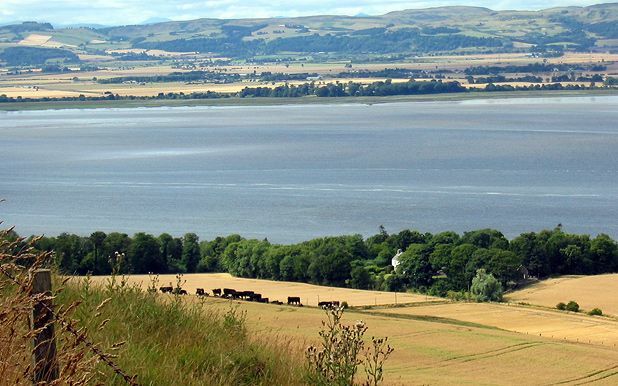 On the same farm, Tom’s nephew Steve created his own splash on the Fife food scene when he introduced a herd of water buffalo in 2005. Farmed on the hills around Camilla Loch, this unique meat has one of the lowest cholesterol, fat and calorific values of any meat. To get up close and personal with one of Steve’s gentle beasts, he’s offering farm tours where you can see the 400 or so buffalo out on the green hills of Fife. You certainly can’t get closer to your food than that. Luing cattle from Strathtyrum Estate. Locally reared poultry and eggs are also produced in Fife. Brothers Tom and Watson Inglis have an Aberdeen Angus herd and a flock of Dalachy Texel sheep on their farm on the south-facing hillsides outside Aberdour. Free range hen, duck and quails’ eggs. Mairi Finlayson and her husband John have a small herd of Highland cattle on their farm from which they supply the local farmers’ market.